Little gold VW busses now grace the Star Bar’s Grace Vault. Elvis grants your every wish when you support the health of your community. Thank you Star Bar for hooking this Bus up with what must be the coolest donation jar imaginable. 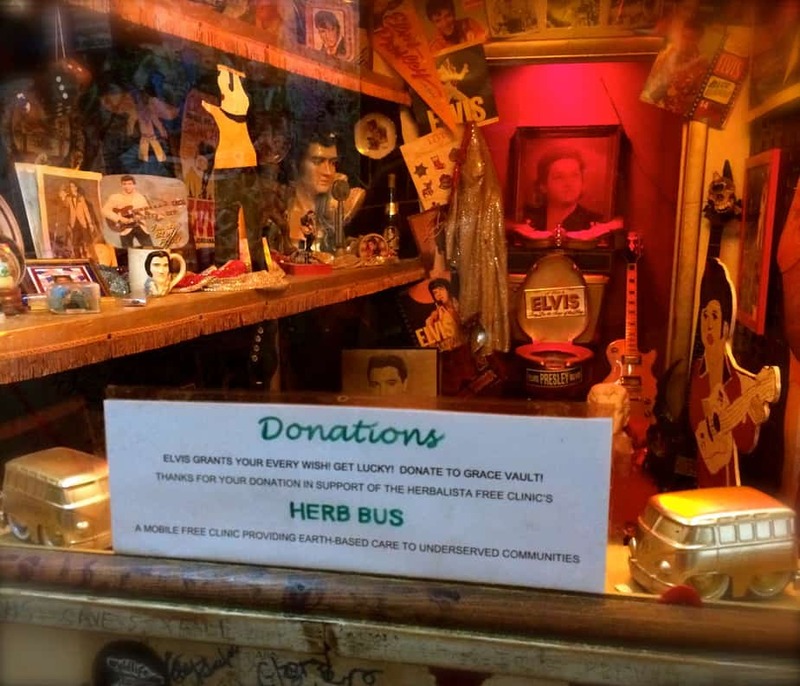 Viva las Vegas and the Herb Bus! Home sweet home! After a long time on the road, the Bus is once again happily parked at Herbalista Headquarters. I am excited to be back, to be wrapped in the green embrace of a vine-covered south, where our creeks rise to late summer storms. I am also honored to call Atlanta home. I am grateful to have been born in a city dedicated to the struggle for civil rights, to have been watered by the reverberating message of Dr. King, and nurtured into an adult (an herbalista, in fact) who is committed to serve. And it is in the very symbol of this city, the phoenix rising from the flames, that we can take inspiration, take up the challenge, and continue to work for the health and happiness of our neighbors, even when times seem tough. When our state closes the door of Medicaid expansion in the faces of the poor, we can open ours. When services and shelter for our friends on the streets are dismantled, we can step forward to provide. As they say at the Open Door, “We gonna do the best we can, till we can’t. I have often been asked, if you need a bus to do what we do. As you can see by the photo above, NO VAN REQUIRED! 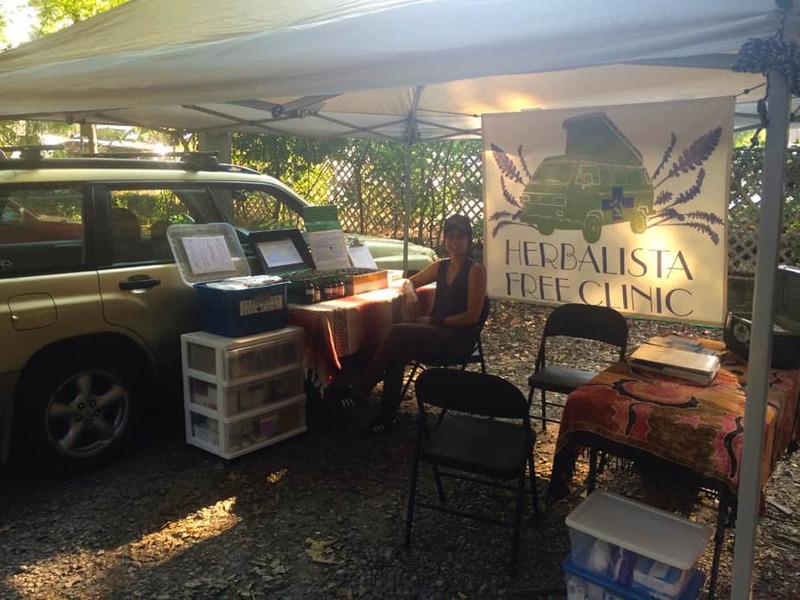 While I was touring out west, clinics continued as usual in Atlanta. 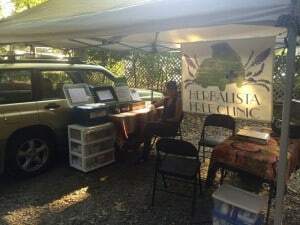 Corinne and Todd popped a tent, pulled out a few tables, and created an “insta-clinic” to serve our friends at the Open Door Community. 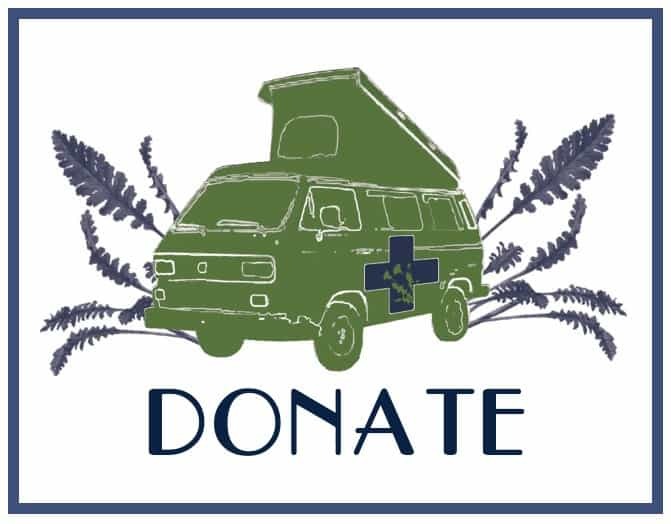 Whether you have a van, a bike, or just a backpack, you can make a difference!